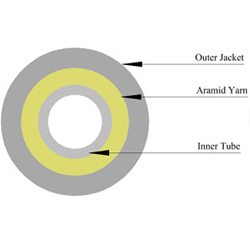 The TLC 2mm, 3mm & 3.8mm furcation tubing consist of an inner tube surrounded by aramid yarn and an overall PVC jacket. The new and improved inner tubes offer better bend ability and kink resistance when terminating and operating. Inner tubes are available in specific sizes to accept either bare or buffered fibers. TLC’s 900 micron furcation tubing is a single tube designed specifically for the protection and termination of 250um bare fiber. 12 standard colors in Hytrel® as well as clear PVC are available.